Blog vs. Website is an important aspect in the realm of web development. It is important to understand the difference between blog and a website before you set out to create any of these. Learn the major differences and decide for yourself. “I am planning to make a website”, Kerry told his friend Bernard who already was running a blog. “I guess you should go for a blog”, advised Bernard. “Why blog? What’s the difference between a blog and a website?”, asked Kerry, sounding a bit perplexed. Difference between a blog and a website is one of the often asked questions in the realms of the web. When you’re planning your online presence, it is important to know this difference because it can play a huge role in how you will develop and maintain your online presence. 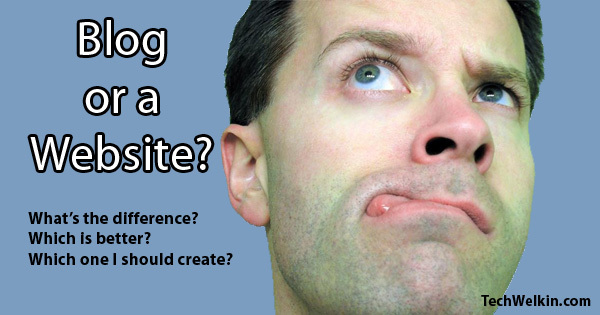 Let’s examine the question and the real difference that lies between a blog and a website. This is the main thing that separates a blog from a website. How you want to organize your entire web content determines whether you need a blog or not. Blogs are actually web logs —where the content is stored in a chronological fashion (much like a diary). New content goes on top of the existing pile of material (like a stack). Both website and blog consist of pages that are interconnected by hyperlinks called URLs. In case of blogs, such pages are called “posts”. These posts are stacked on top of each other sorted on the basis of date of creation. A website, on the other hand, houses content that is hierarchically connected. There is a root page (called Home Page or Index page) and other pages are organized like a tree structure under the root. A website does not bother about the creation date of a page. It is up to the website developer to decide how to link all the pages with each other. It is important to understand the difference between blog and a website. If a page is not linked at all in a website —it is referred to as an orphan page. Such a page can be accessed only if you know URL of that page. Because of the lack of a link, you can not just “surf” to that page. Because the structure of blogs is well defined and is driven by chronology, there are a number of free blog platform available that can be used to easily create a blog. A website is usually developed from the scratch. You’ll need to make choices about platforms (e.g. Windows or Linux), databases (e.g. mysql or SQL Server), programming languages (e.g. PHP, ASP, Java) and then ask a developer to tailor made your website according to your requirements. Obviously, being custom designed, a website gives you more flexibility in implementing the idea that you have in mind. Most of the blog platforms allow but only limited flexibility. Blogs are relatively much easier to maintain. If you make a blog on an open source platform or a free blog service —you would not need to worry about code development and maintenance. Developers of the platform take care of removal of bugs and further development. Website code, however, needs to be maintained by you or the developer hired by you. This may entail extra cost. Many people say that a website is static and a blog is dynamic in nature. I don’t agree with this. Website can both be static or dynamic. Modern websites should not be seen as static webpages of the bygone era. Also, how static or dynamic your web presence would be —it depends upon how much content you will upload. If you don’t write posts, even a blog can be practically static and websites like that of a shop may see changes on daily basis! Here again I defer from commonly held view that blogs are abundantly “SEOed” whereas websites have limited SEO. Well, SEO affects both website and blogs equally and in similar manner. Blogs platforms are built over the years and usually by large team of world-class developers. So, in that way, blog platforms are automatically better optimized for search engines. But, otherwise, if you put in resources, you can very well have a website perfectly optimized for search engines. No one stops you from doing that! And in fact, you should do that. This is it for today, guys.I hope that this article made the difference between website and blog clear. If you have any doubts or questions, please feel free to comment and ask me. Thank you, I’ve recently been looking for info about this topic for a while and yours is the best I have found out till now. How to find the differences between blog and webpage and website practically. please explain to me in detail with a real time example sir. Good ideas. I am looking for such an article because I was confused about blog and website. I didn’t know the difference between blog and website. But after reading your article, I got a clear idea. Thank you very much for sharing such an important article. Honestly saying i have bookmarked this since i had some doubts between websites and blog which are now cleared. Thank you so much for the blog. Great ideas… Everyone should be know about the difference between blog and website.